Let's build online maps that make a difference. Let your online maps look and feel their best with MindFusion's innovative mapping component for ASP.NET. It includes a .NET web control and a class library that let you create fast and easy any type of regional, national or world map. Maps can load data from the popular ESRI Shapefile format and MindFusion.Mapping for ASP.NET ships with an impressive set of *.shp files. 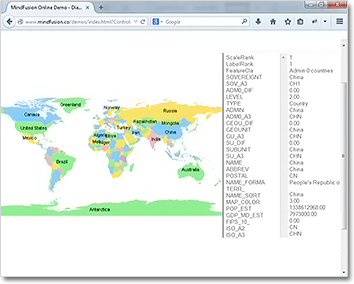 You can easily load details about any country, rivers or other geographical objects. 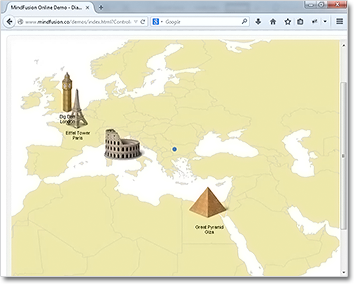 Treat your users to the advanced pan and zoom functionality of MindFusion's mapping control. Users can smoothly change the visible portion of large maps by dragging with the mouse or examine the tinest map details simply by scrolling with the mouse wheel. Layers let you add decorations to maps to mark places of interest or render important data. The number of layers you can add to any map is unlimited. MindFusion.Mapping for ASP.NET is provided with numerous samples both in C# and VB.NET, which demonstrate every feature of the component. Detailed tutorials and extensive offline and online documentation guarantee that you have plenty of API information close at hand. The mapping control is part of MindFusion ASP.NET Pack and is distributed and sold only as part of the pack.